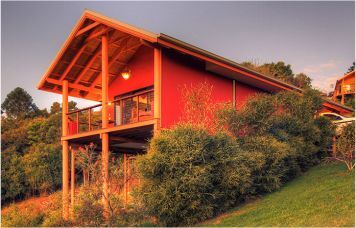 Our 3 styles of lodging near Maleny & Montville including B&B and Villas. 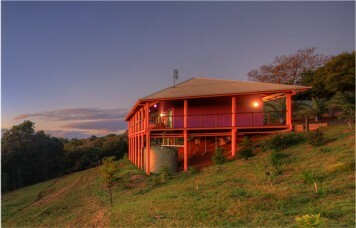 Maleny Tropical Retreat is located on the quiet 'country back road' between Maleny and Montville. 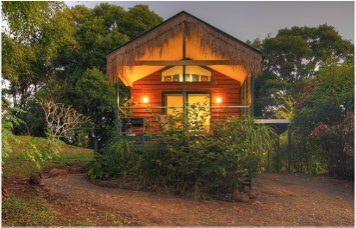 Maleny Tropical retreat comprises a historic farmhouse B&B and several outhouses. Recently we have also added the self contained Abadi Villas. 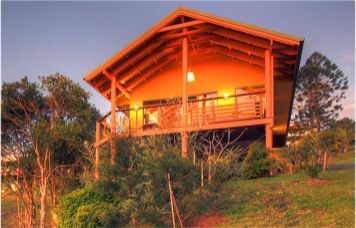 This allows Maleny Tropical Retreat to offer varied styles of Self Contained and Bed & Breakfast accommodation. We are only 10 minutes from Maleny and 8 minutes from the famous Hinterland town of Montville. Check in time: From 2:30pm. Check out: 11:00am. Original Farm House Relax amidst the rainforest tree tops in our Bed and Breakfast room, Ubud. 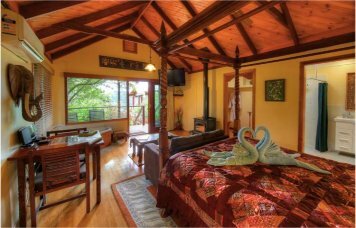 King size bedroom Relax by the fire after a soak in the spa pool has become very popular at Maleny Tropical Retreat. Large spacious loungeRelax and refresh yourselves in the spacious lounge with Foxtel TV. 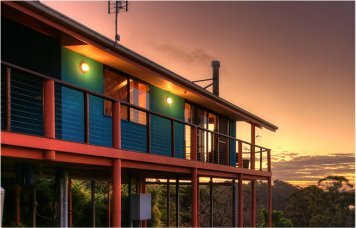 Our Maleny Bed & Breakfast accommodation is offered in the old rural farmhouse which has been extensively modified throughout. Original T & G flooring and extensive Balinese artifacts all contribute to the rich sense of character and add to the feeling of warmth. Three double rooms (Ubud, Sanur and Lovina) are available. A delicious continental breakfast including peeled and sliced fresh fruit, yoghurt, cereals and fresh Croissants is served in the dining area of the lounge, where enticing settees and extensive DVD library may tempt the less energetic ... Complimentary email facilities and wireless broadband allow you to keep in touch with family, friends or business contacts. Wet room Shower Large spacious walk in shower en-suite. Self catering cottage accommodationUnder-floor heating keeps the Cottage warm year round. Large spacious KitchenCombined open plan kitchen & dining area. Like a rainbow wrapping around a mountain, our vibrant Abadi Villas dot the rolling hillside. Far away from neighbours and hugged by tropical gardens, Abadi Villas are the perfect place for a private mountain escape. Each Abadi Villa is a contemporary Balinese retreat, with delicately carved timber features and tropical detailing. 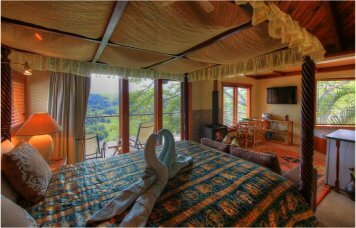 Providing delightfully cozy accommodation for two people, they all have Queen beds with ensuite bathrooms. 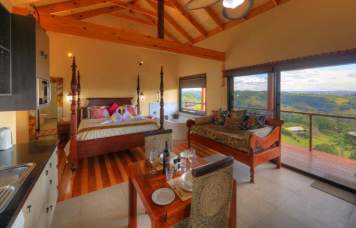 Living areas look out over the farm to Lake Baroon. The rural Villa kitchens have everything you are likely to need from toaster and coffee plunger to microwave oven and dishwasher. All guests have access to a communal electric barbeque in our picnic Gazebo. With floor-length windows looking out over the farm, all are bright and the open-plan design ensures views from all directions. With their own car parking area incorporated into the design, they are the perfect retreat for those seeking seclusion and independence. A small cosy and comfortable cabin Tuban is a tastefully renovated cabin with Kitchenette and large separate Spa room. Full Kitchen in Nusa Dua Where all the basics are covered. Dining table, chairs, etc with all utensils. 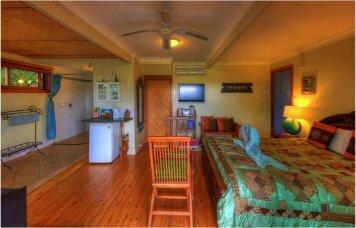 Benoa is the newest villa The villa has a King bed & ensuite bathroom.